Not to be confused with World 5-7. Game Mario vs. Donkey Kong: Mini-Land Mayhem! Area 5-7 is the seventh course of Sandstorm Steps and the forty-third course overall in Mario vs. Donkey Kong: Mini-Land Mayhem!. It introduces Capture Kongs, which "kidnap" certain Minis and can only be stopped with Hammers. The level features four Mini Marios, though not necessarily in the same starting positions. The Mini Marios all begin on the left with two on the upper level, one on the middle level, and one on the lower level immediately captured by a Capture Kong, with the exit door on the bottom left. In order to reach it, they must be guided via a series of Blue Ladders and Red Girders to the Hammers in order to take out the Capture Kong. The M-Token is located near the middle right, atop a platform on the middle level. To collect it, a Mini Mario must simply follow a Blue Ladder up to the upper level, then fall down and turn left to it. 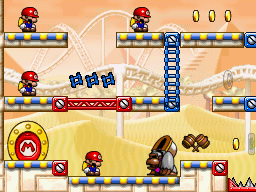 The Mini Mario Card is located on the bottom right, atop a Red Girder platform on the lower level right next to the Hammers. A Mini Mario must drop down to the lower level via a Blue Ladder on the very edge. In order to earn a trophy, the player must score 15300 points. In Plus Mode, the two Mini Donkey Kongs must be guided to the exit door first, followed by the two Mini Paulines. In order to earn a trophy, the player must score 14800 points. This page was last edited on September 18, 2018, at 06:20.